These personalized hangers are not only great Christmas gifts, but the perfect gift for a bride-to-be! It would look great with the wedding dress hanging for pictures. This one is pretty self-explanatory. 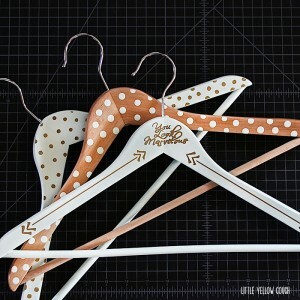 Paint the hanger, use the Sharpie to make the dots or whichever design you want. If you’re writing a name or saying, use the transfer paper to keep from making too many mistakes.